* The Spiritual Exercises (original title Exercitia spirituality) are a work of Ignatius of Loyola. They constitute the method of spirituality proper to the Society of Jesus. 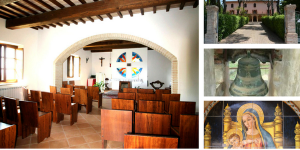 In the common language and in the Catholic Magisterium are also in general so-called spiritual retreat Practices: “A set of meditations and prayers in an atmosphere of recollection and silence” where the Holy Spirit can particularly act, conducted Typically “with the mediation of a spiritual guide”, “in order to the purification of the heart, to the conversion of life and to the following of Christ, for the fulfilment of his mission in the church and in the world. 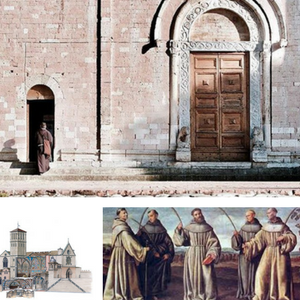 If you have a thought of organizing a period of spiritual exercises in Assisi, Villa Santa TECLA will be pleased to put you at your disposal: The structure has in fact already gathered together the basic features desirable to the good success of this Particular type of stay: In addition to the comfortable rooms, the kitchen, the restaurant halls, the bar, the ample classrooms for the study and the meetings, there is the usability of the church, in the collection position as well as of the large outdoor spaces, in a frame that favors both the Recollection useful to the study and to the prayer, that the healthy wellbeing guaranteed by the purest Franciscan habitat inherent in the unspoilt Umbrian nature. Practicing a particular moment of prayer then, it is extremely practical and lacking unnecessary toil: from the ideal position of the Villa next to Assisi, you can reach all the sacred places present in Assisi and D in Umbria in a short time, without the dispersion Traffic and parking lots.